India has 29 states and 7 union territories which are connected through a number of highways. To enhance the scenic beauty and Eco-friendliness of the road journey, the Union Ministry of Road Transport and Highways and Shipping has planned a mission to make a initial plantation drive on 1500 km of Indian Highways. 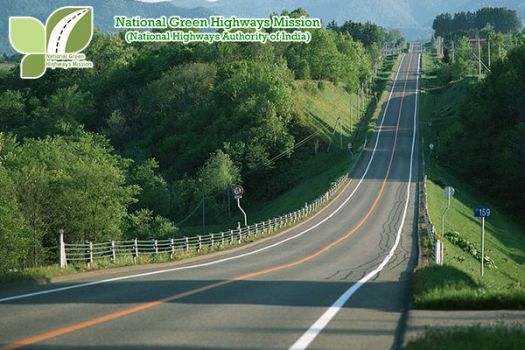 The mission is named as National Green Highways Mission (NGHM). According to the Government, the mission can play a crucial role in the development of agricultural and rural economy. Approximately 300 Crore rupees is estimated to execute the project successfully. Considering the increasing rate of environmental pollution throughout the world, The Government of India put it's focus the afforestation and has taken a positive step to cover the highways with greenery. As well as, it will help to increase the employment of local people.The 1500 km plantation drive will need 15000 people as one km of plantation will provide employment to ten people.The total National Highways are 1 lakh km,state highways are 1.5 lakh km and other roads are 49 lakh km. The project is initially made for the National Highways. After the complete implementation of the plantation drive on National Highways, the state highways will be taken for the project. Aim of the Mission- Apart from the afforestation, the mission aims to improve the livelihood of local people with a touch of greenery.It will be beneficial for the rural economy and agriculture through the participation of local people. Though the contract is given to big PSU, NGO and other organizations, they will need to local people to work in that project. As a result, employment rate must increase.Those trees, which are to be planted, will give fruits, flowers and other goods of economic importance. Thus the local people also get benefited. It will reduce the rate of air pollution and dust. The trees and shrubs will act as the natural anti-pollution agents and will prevent the soil erosion at slopes.The plants on the highway median strips will decrease the glare of the other moving vehicles. Thus number of accidents must be minimized. It will decrease the 12 lakh metric tonnes carbon emission under the Green Initiatives according to the Paris commitments.On the other hand, 2.5 billion additional carbon sink will also be possible outside the forest areas. The plants are chosen as per the local climates like rainfall, types of soil etc.The favoring environmental conditions must be kept in mind to avoid the premature death, under growth of the plants. For this reason, local people must be involved in that process to guide properly. Funding of the Project-The investment plan of the government is quite satisfactory in this project. One percent of the total fund to make a national highway is kept aside as the green fund. Within 1-2 years the project is expected to be completed and it will definitely have a great impact on the economy of India. Government has estimated to spent approx 5000 Crore rupees in this project.They also ensure the additional activity and repair work on these highways throughout the country. Involvement of Public and Private Institutions- Several steps are taken to engage the local people and private organizations in this mission. 'Adopt a Green Highway' program is launched to engage the corporate sectors, PSU and other govt. organizations to develop green corridor along the national highways. As well as, the ' Kisan Harit Rajmarg Yojona' will encourage the local farmers to involve in this project and earn an alternative livelihood option in nearby areas. CPSUs have also showed interest in this project. The main motto of this program is to involve the population in development process. There will be a separate monitoring plan of this project. Latest Satellite Technology made by ISRO and NGHM mobile app will help to monitor the project with all real time data. An audit will be done and every planted tree will be counted. The Government is also planning to link the project MGNREGA and emphasizes on the creation of new assets. NGHM and Yes Bank have signed a joint charter to increase the awareness to make the highways green. Usage of the solid waste to make the roads and Eco-friendly fuels in vehicles is also proposed. Government and Supreme Court make a joint collaboration plan to fight against pollution. 10 states are already on board for the Green Highway Initiative. Awareness among people and their active participation can make this mission a civil society movement and will help India to be a “Nation with Natural Highways”.